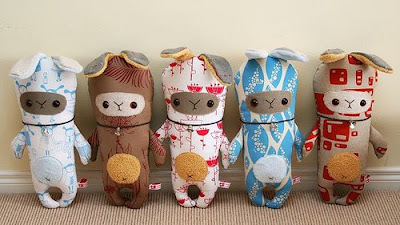 I've always been a fan of Johanna's softie creations, especially her little peg animals. Left to right: Shannon Lamden, Kristen Doran, Danielle Smeets, Lara Cameron, and Bianca Van Meeuwen. It looks like they're all sold already except for Shannon's one far left, which you can snap up here. Hey Lara! Thanks so much for the mention! And thanks for the link to Pippijoe's - yay for more Aussie fabric designers! They are cute. It nicely highlights your fabric design. They are so cute aren't they! I love that photo with them holding hands :-) Jhoanna is very talented! hehe... very cute! love collections like this. What a great idea for the dolls. Reminds me of last year's kokeshi exhibition where different artists painted dolls. The cutest "hit men" ever! Woke up late and missed the peg bunny with your blue pebbles fabric! I need to wake up earlier.